250cc Superhero: Champagne Asphalt and Mudslides. 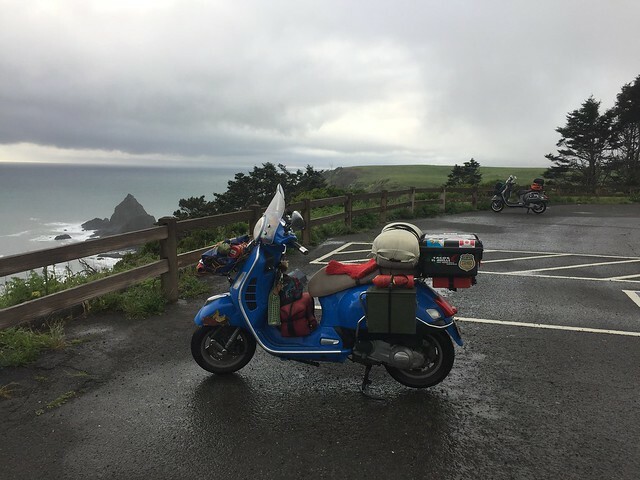 San Francisco, CA to Gold Beach, OR. April 24 - 29, 2017. The light at Vive la Tarte is exceptionally flattering. The snacks, exceptionally fattening? 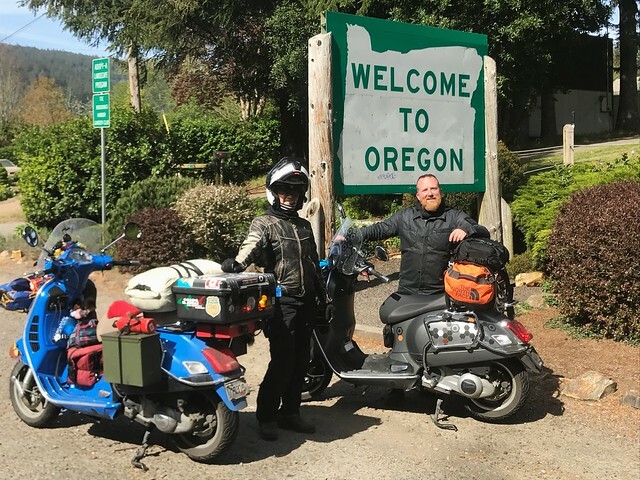 Pete had taken time off to ride as far as Oregon with me, but we had a couple days before launch – just enough for one last Founders Ride with Verna. 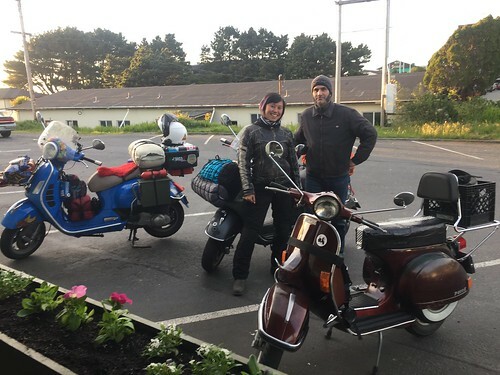 After all, he was also saying farewell to San Francisco, and a jaunt up to wine country with the founding members of this scooter club was on his bucket list. Hurrying to meet them on time, I hopped on Serenity and fired her up. I'd been taking the PX200 around Boston for a couple weeks, and jumping from that to the GTS... Serenity felt tall, heavy, and clumsy by comparison. It was like driving a couch. 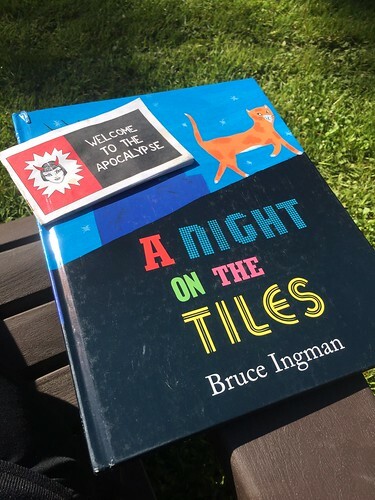 Before I could question my decisions further, I leaned into the first turn and muscle memory dropped into place like a missing piece of a puzzle. I knew this bike in my body, I was home. Instantly, I could see myself bumping along British Columbia, the Yukon, and Alaska on this thing. 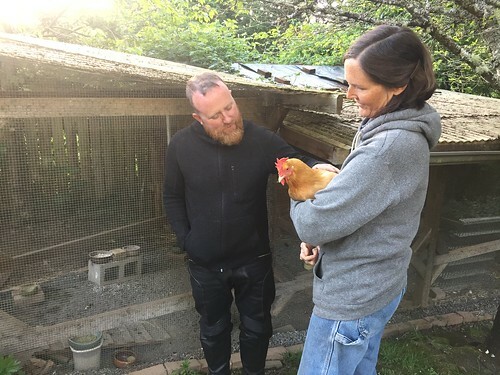 I felt overwhelmingly like I'd made the right choice, and I had a whole day with Pete and Verna to look forward to. Curvy vine-lined roads with these two. 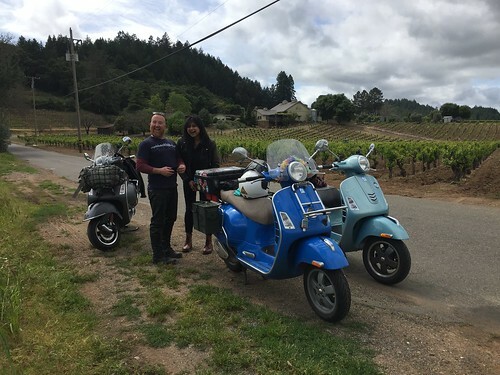 We wound our way up Lucas Valley Road, and took a break at Marin French Cheese Co for a dairy snack... Or if you're me, the lactard, fantasized about hardware required to attach an overpriced wine and cheese basket set to the rear rack. 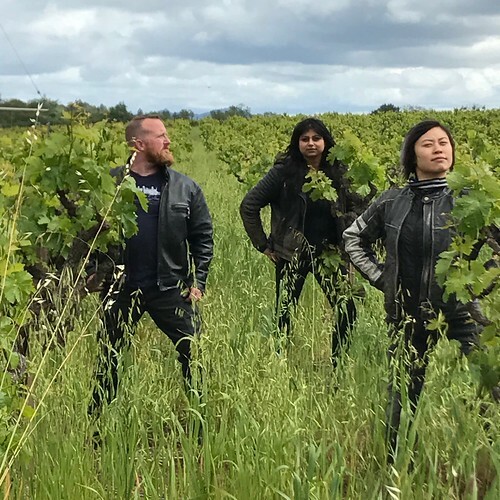 Vespiti in the vines, posing for the album cover. An impromptu photo shoot later, the afternoon proceeded to Verna's pick, Ridge Vineyards, and a gourmet grocery picnic in Petaluma. It was a penultimate day for the ages. A different kind of farewell drink with Moose at Trad'r Sam. Launch day weather promised to do its best to make me forget how much I was going to miss California. Colder and wetter than I would have liked, but today is the day. Pete pulled up in a cold drizzle, and Moose was tagging along as far as he could. 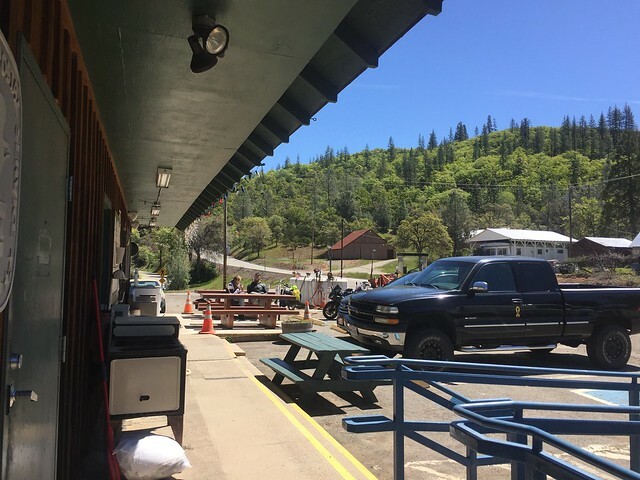 MV forum member Stang aka Jon, had reached out and we'd intended to meet him at his hot dog stand near Larkspur, appropriately named Stang's Hot Dogs and Sausages. Unfortunately, it turned out he would be out of town the day we rolled through, but he extended his hospitality to all riders in the party! Thank you, Jon, they were the perfect road fuel for a damp and chilly day! This was no ordinary hot dog stand, I would learn. 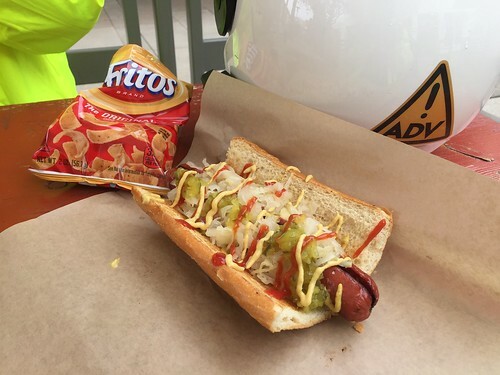 These gourmet dog were top quality, with snap, flavor, and quality ingredients. Fancy dogs keeping our bellies full, thanks again, Jon (Stang)! Pete and I said one more farewell to Moose, donned our matching highlighters (dammit, we're those people... it's only because we bought our gear at the same place! ), and pointed the bikes north along the coast. Clouds caught up with Pete and I, but there's no denying the beauty of the coastline. Gotta fuel up and warm up. Fancy fridge doors in here. It was one of those rain gear on or off kind of days. 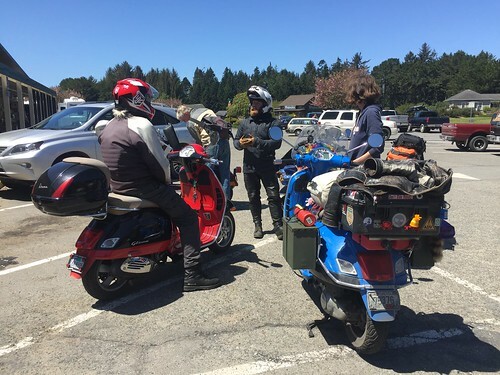 That little piece of CA-1 just south of Mendocino might have been the last part of the Pacific Coast Highway I hadn't set tire on yet. 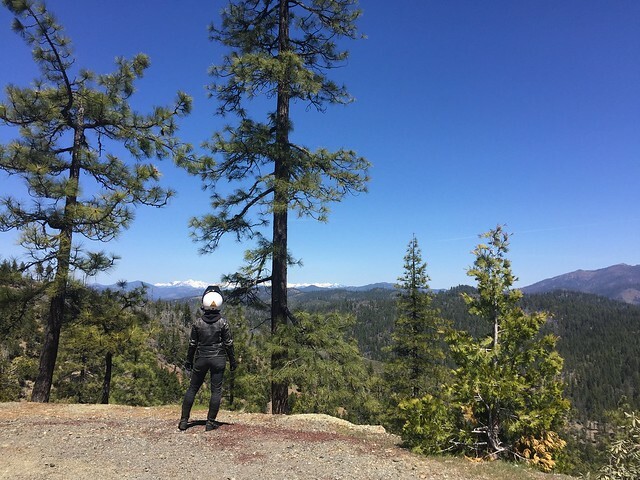 After so many miles up and down California, a quiet sense of completion joined the mix of emotions kicking around my chest on such a moody day. 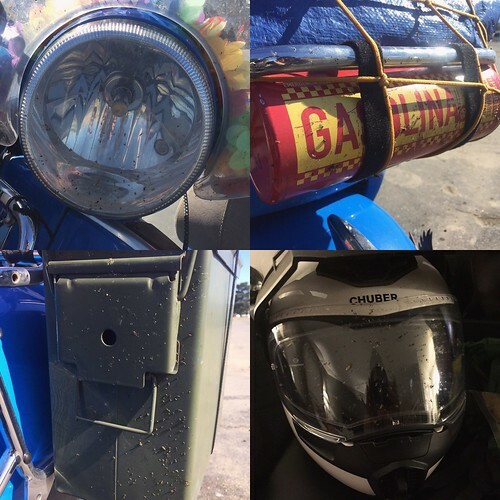 There were a lot of "finally's" happening, like finally going on a camping trip with Pete (if you recall, two years ago our trip was indefinitely suspended), finally taking Serenity on a long haul after her rest in Pete's garage, finally breaking new ground. 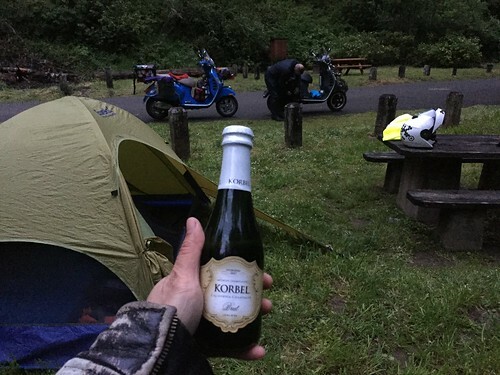 First night at camp, time for a tiny toast! 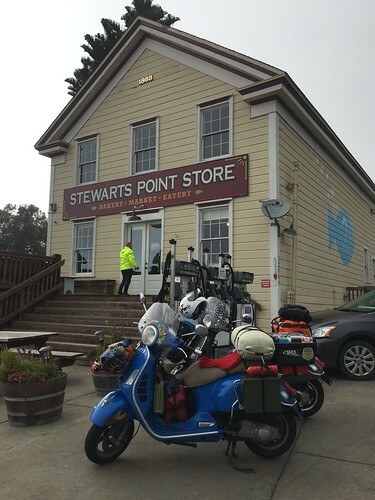 In spite of the dampness and chilliness, we pitched tent at Russian Gulch and rode back into Mendocino for dinner. The pickings were slim in the off season, but Pete offered to buy and we hauled our soggy, helmet-haired, fully-geared asses into a cozy candlelight establishment. After a solid day of cruddy weather, the restaurant was so warm, comfortable and infinitely endearing. Filet mignon happened (we shared), as well as red wine and camaraderie. I didn't want to leave, but we found our way back to camp and I fell into a blissful sleep to the peaceful burbling of the nearby creek. 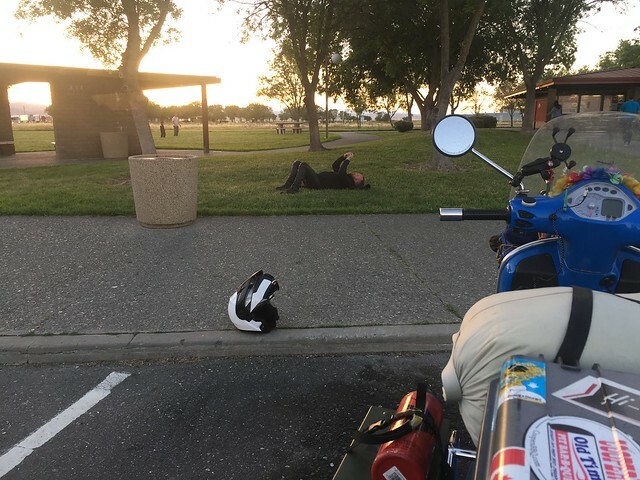 So I guess the next morning was as good a time as ever for my bike to not start. Of course, there was no cell service in the gulch either. Pete rode out to troubleshoot with SF tech Matt over the phone, while I starting poking around under the pet carrier... and discovered my spark plug was loose. With that tightened back down, I figured the day was going to be just fine (cue foreshadowing). 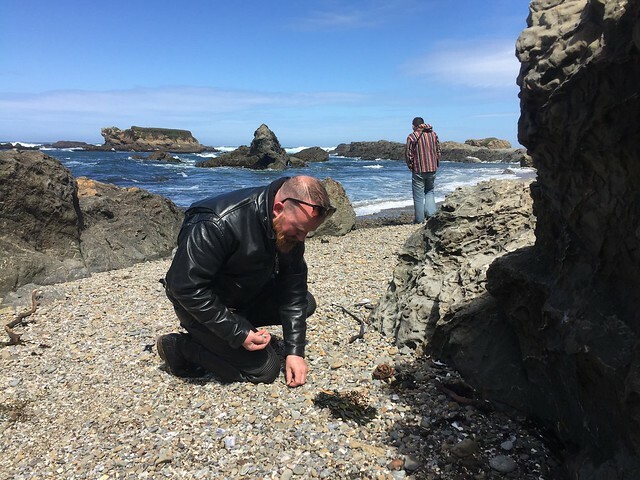 I wanted to take Pete by Glass Beach, Fort Bragg, CA. The sand is loaded with smooth beach glass. It's pretty cool, until you learn that it's due to years of nearby dumping. It didn't stop me from enjoying the beach and clear skies. 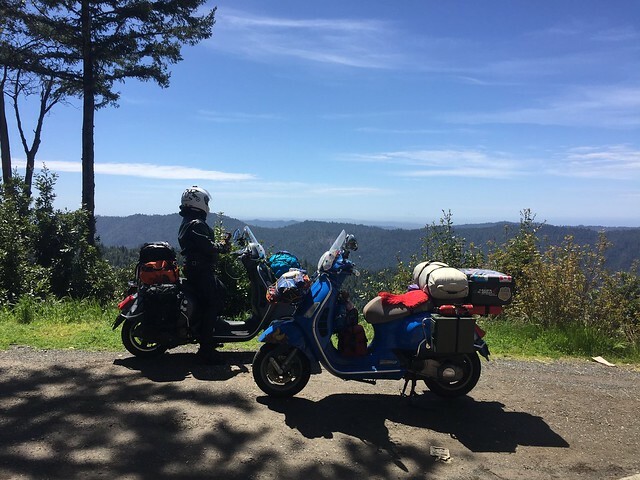 Lisa of the Humboldt County Slugrockets Scooter Club had reached out to me a while back, and I was aiming for her and Rob's place near Eureka, CA. In sporadic bursts of cell service, I received a message warning of an epic landslide that had closed off 101 near Leggett the night before. 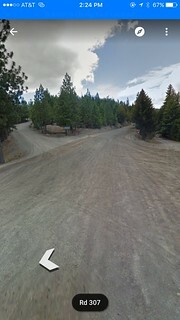 Traffic was being redirected along Bell Springs Rd, a smaller unpaved road, but as we went it the word was that was closed to through traffic as well. 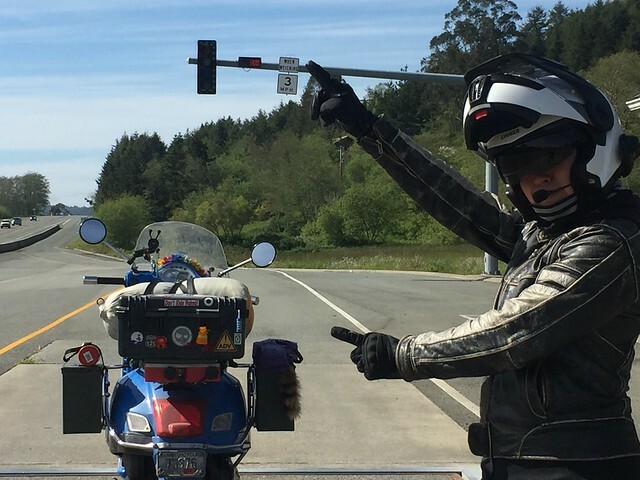 I suggested to Pete that we try and charm our way past, much like Morgan Territory Road, but upon arrival it was clear the young officer was having none of it. 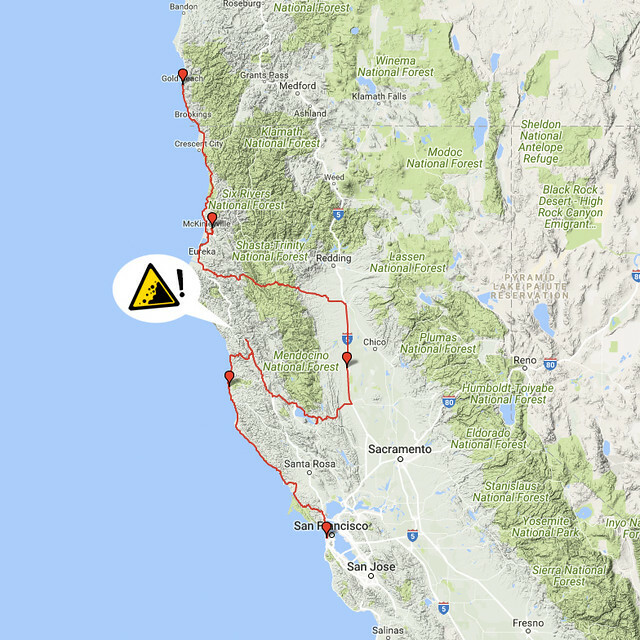 To get any farther north, we would have to ride far inland, 280-ish miles out of our way, almost closer to SF than we'd gone, to pick up I-5. I was quietly panicking, because this would add an extra day to our route and Pete only had so many days of dog-sitters lined up. He seemed happy to get as far as we could though, so I routed us inland via Branscomb Rd and CA-20. Sun is shining on Branscomb Road. 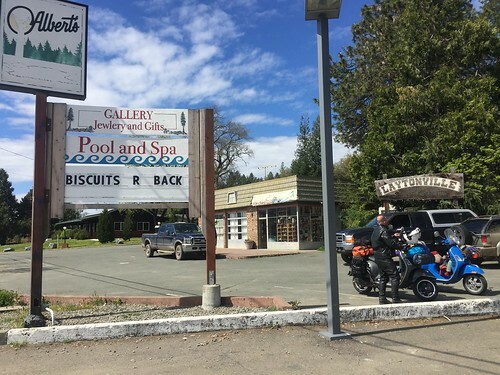 Across from the gas station in Laytonville, CA I'd noticed a sign advertising biscuits. 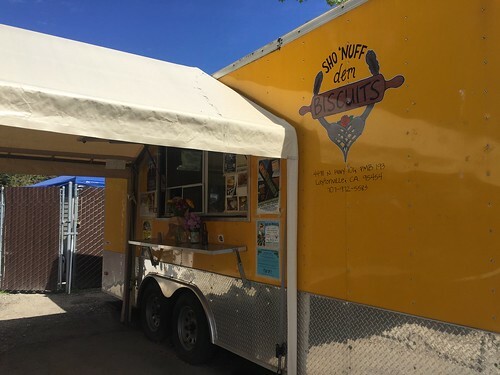 It turned out to be a food truck with honest to goodness southern food, Sho'Nuff Dem Biscuits. I had anxiety, until I saw the sign for biscuits. The guy is from Georgia and does things right. Timing couldn't have been better, because decisions made on empty stomachs are never good decisions. ...As tempting as it was, we were past the halfway point in the day and I wasn't confident we could take the gravel roads on two GTSes and make it to Willows by sundown. 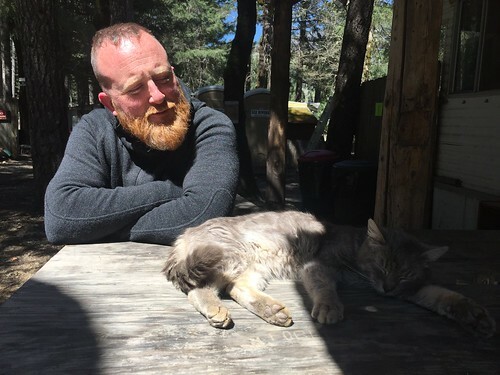 Pete made it clear he trusted me implicitly for either route, but as I mulled it over some fried chicken and biscuits, eventually the decision was to leave the forest roads for another day. 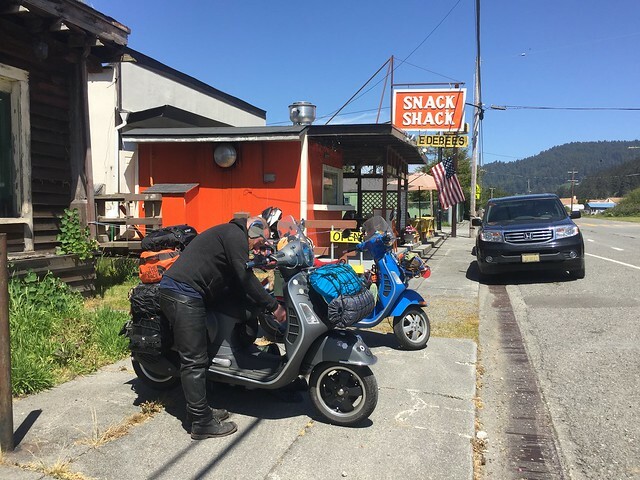 We continued down CA-20 towards Williams, and picked up I-5 (yaaawn) to a motel in Willows. 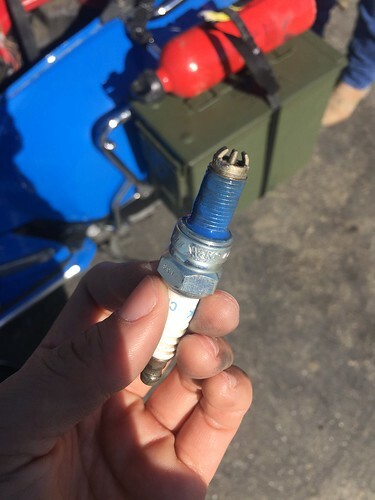 It would turn out to be a wise decision, because my spark plug would fall out twice more before the day was done. A refractory period was necessary each time it happened, until the engine was cool enough that I could thread the plug back in. If we had taken the wooded route, I'm sure we'd have found ourselves on a mountaintop in darkness. At least it had the courtesy to fall out a mile from a rest stop, so I could coast in. Thanks for the motel, Pete. We still put the tent up, to keep it real (ahem, dry it off). Murdered some bugs across California. Going to murder some breakfast at Nancy's Airport Cafe. Remember, full stomachs for decision making! 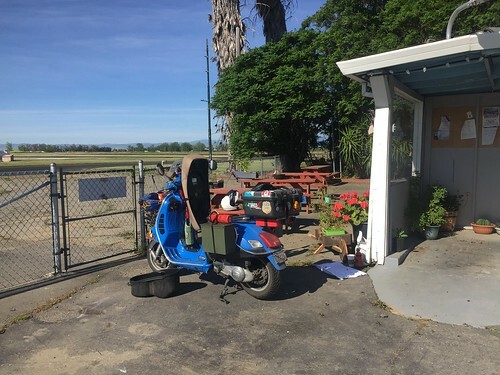 A place across the highway called Nancy's Airport Cafe reminded me of Ken/Lostboater's affinity for airport stops. 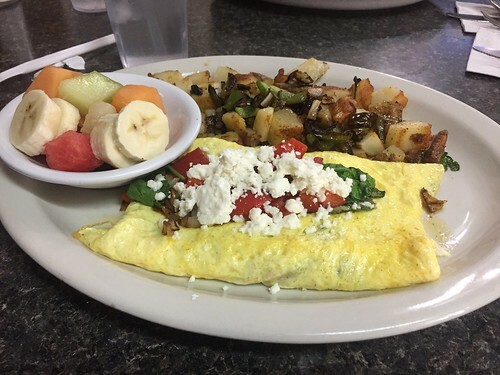 It turned out to be a fantastic breakfast choice, complete with a service attitude that could have been transported from NYC. Overheard from the table next to us upon their inquiry into the corned beef, the waitress did not mince words, "It's from a can." As for the blueberry pie? "I can't say I've had the blueberry. I don't like blueberries." For what it's worth, my breakfast was to kill for. 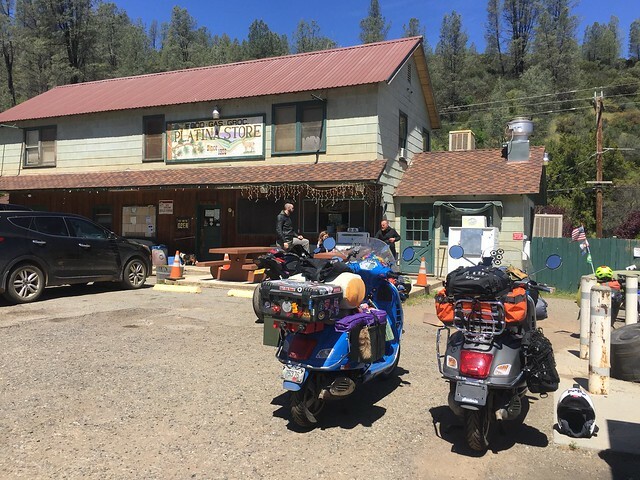 Before we left, another diner and rider struck up conversation and affirmed our decision to take the main road to Willows – he regularly took dualies over the Laytonville Dos Rios Road, and the current road conditions were poor/nearly impassable due the recent rain. Whew! Good thing I make decisions after chicken and biscuits. Now to deal with this spark plug. Picked up Loctite at the hardware store. Now stay in there! At least till Seattle. I forget sometimes how remote parts of California can be. 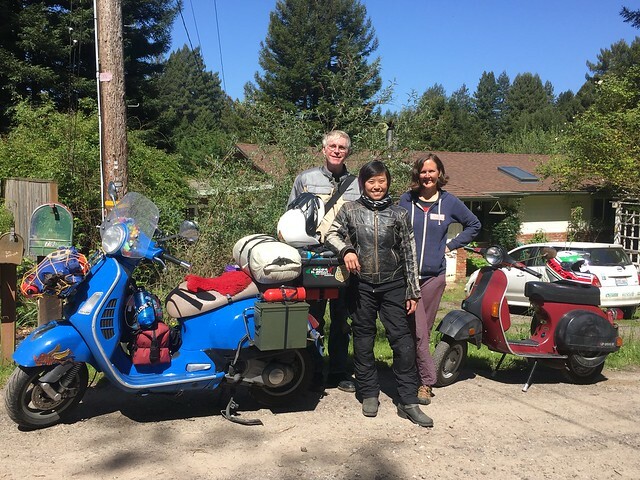 Crossed paths with two other riders, headed from Portland to SF for a wedding. Now that's the way to go. We warned them of the road closures. 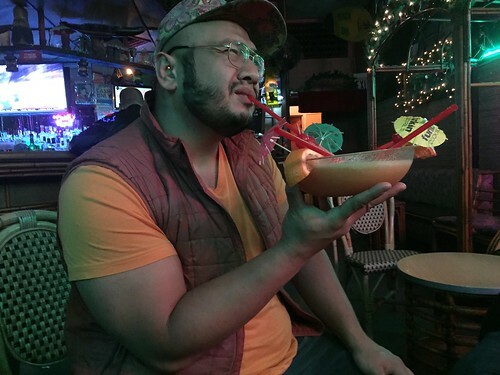 Are we still in California even? Back over the mountains towards the coast. Damn, I'm going to miss being near this. 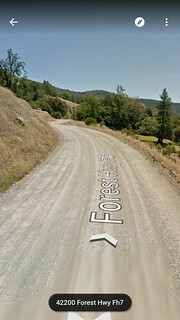 "Champagne asphalt," Pete dubbed the mountain roads over intercom. California is pretty dreamy, when it's not on fire or sliding off the face of the earth. It's rhyme for a meat break. 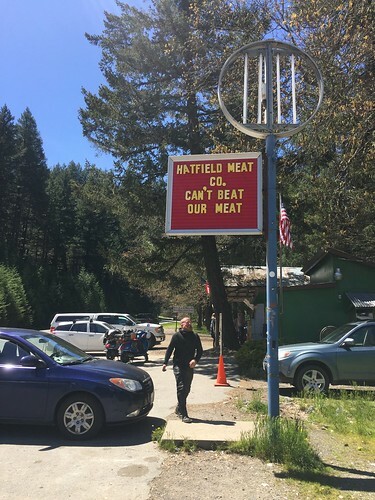 The sign for Hatfield Meats reminded us it was as good a time as any to break, and make sure we continued to make well fed--I mean, informed decisions. Their burger bar operated out of a trailer, and a scrawny cat and a couple older loggers welcomed us to the picnic table. 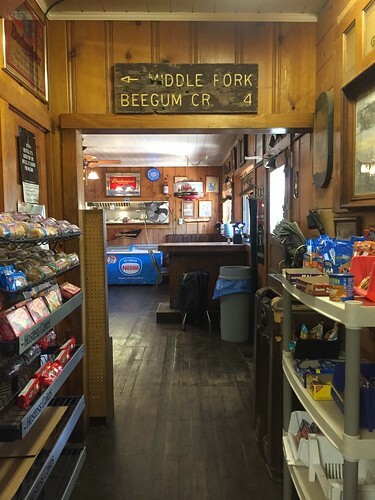 In the dappled shade of the forest, the loggers chatted with the ease of regulars; they both grew up in the region and attended a single room schoolhouse of 11, and told stories of the time they felled a tree 25ft in diameter. 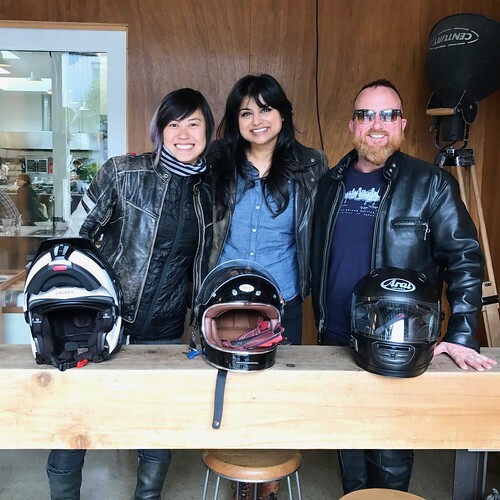 They'd been enjoying burgers at this spot most of their lives before we scooted in ("It's not fast food, but it's worth the wait."). With hyper-connected tech metropolises like San Francisco, it's a trick to remember California shares territory with secluded places, where the pace of change is slow and cell service can't penetrate. As the loggers rolled out, they recommended we stop by Grizzly State Park (we did, it was glorious), and I felt richer in belly and spirit. Mad River Burger Bar cat. 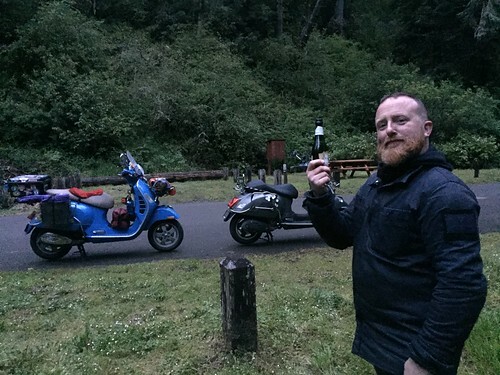 Upon reaching the coastline, my latest intel was to find Rob at the neighborhood tiki/dive bar in Eureka – of course, a scooterist's natural habitat outside the garage. 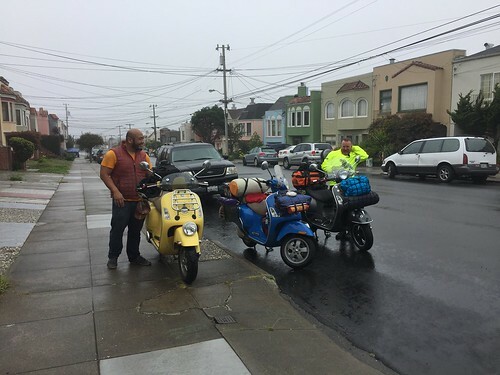 As we pulled up to the edge of town I saw several other scooters parked in front of The Shanty on 3rd and C St. Rob and the present Slug Rockets had been waiting for us. 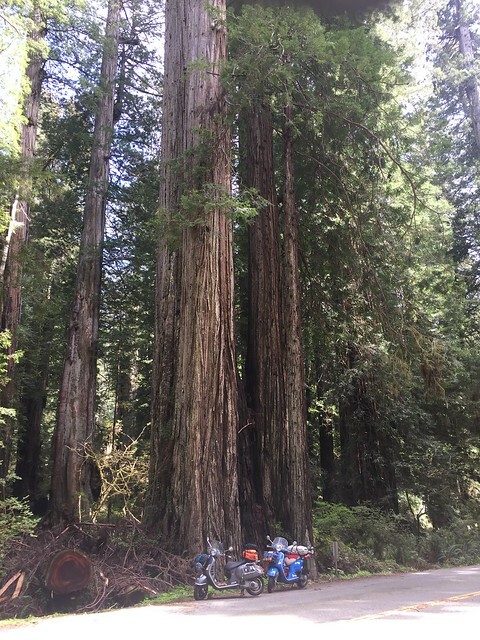 One welcome round later, and we followed Rob to their home tucked in the Redwoods. Rob's garage sign, custom made by Lisa. 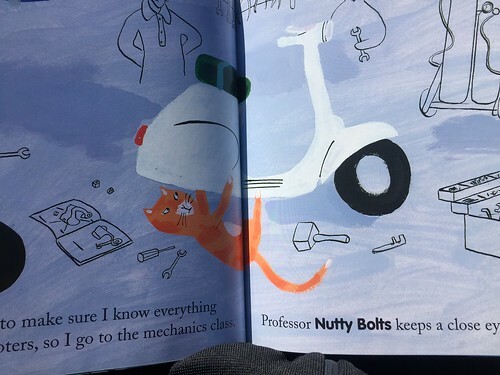 More on Nutty Bolts later. 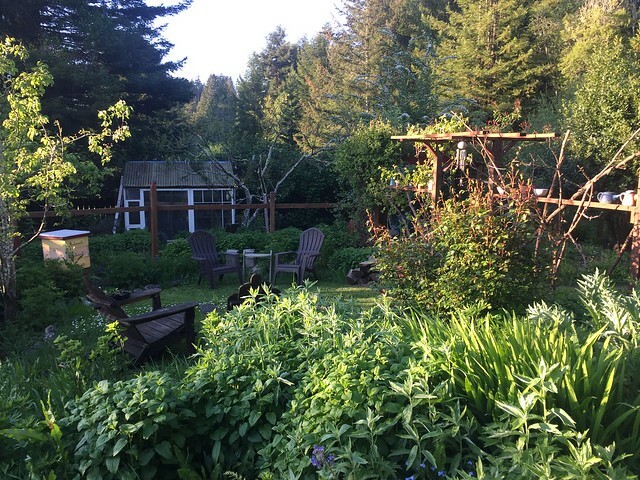 Lisa and Rob's backyard in the Redwoods. WFS seems to be contagious. Dammit, Rob! Lisa and Rob's artist, artisan, philosopher, tinkerers and thinker friends all stopped by the table at some point through the evening. The burgers came recommended, so we double-downed on our daily intake (remember, good decisions). The crafts community reminded me of those around Asheville, NC. The music was lively. The vibe was familial. With the warm thrum of alcohol in our bloodstreams, bellies full of burger, and toes still tapping in time with the bass Pete and I followed our hosts into the cool nighttime air. There is no deeper black than trying to find your way through the woods at night. After we said farewell to friends and left the street lights for the dirt path home, it was as if a dark velvet cloth was slowly lowered over my face. Trees blotted out the starlight overhead as we ambled, their arms eventually becoming so thick they became a single shapeless void, extinguishing all spatial awareness. I was completely disoriented, but Rob and Lisa had walked the path home from Fieldbrook at night many times. 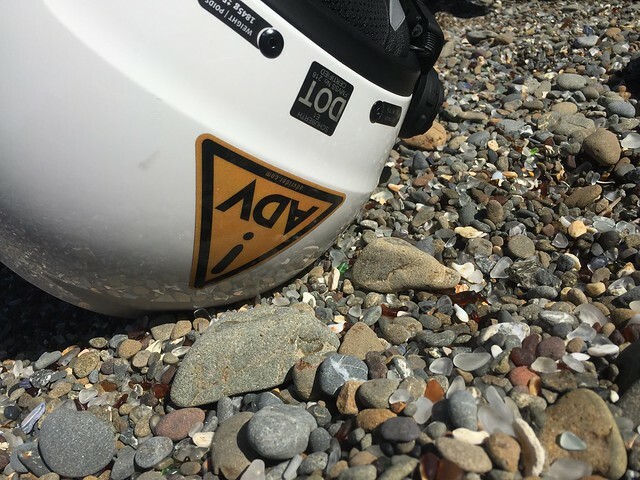 Rob pointed out a weak pinprick of light, a lamp of indeterminable distance flitting between branches, that he used to guide himself over the invisible obstacle course – uneven ground, mud, potholes, even a plank bridge. I gave up on my night vision entirely, and for several moments merely followed Rob's disembodied voice. Somewhere ahead I could hear Pete and Lisa's footsteps too, and punctuated them with my own loud Splash! every time I missed the path but found a pothole instead. Good thing these boots are waterproof, and I made it over the bridge without a much bigger splash. Of all the fantastic experiences that evening, the walk through the nighttime woods was most unexpected, and humbling. At the house, we poured over Lisa's artwork, and a photo book by an Italian Vespa traveler they hosted a while back. We chatted until I could barely keep my eyes open. It was one of those highly condensed experiences, the sort that happen with kindred spirits because there's just so much to share before giving in to unconsciousness. 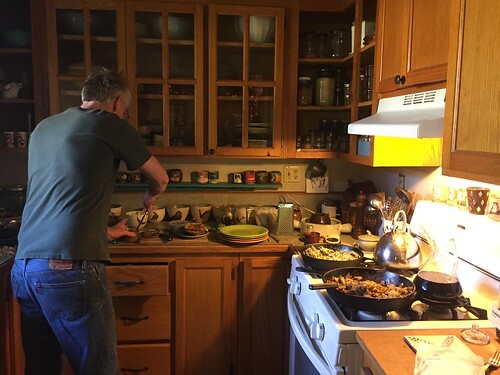 Rob prepared a gourmet breakfast with eggs from their chickens, local apple butter for toast, and honey from their bees for Chemex-made coffee. What a spread. 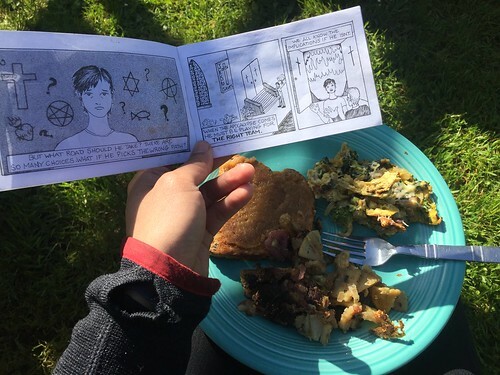 Some reading material for breakfast in the sun. 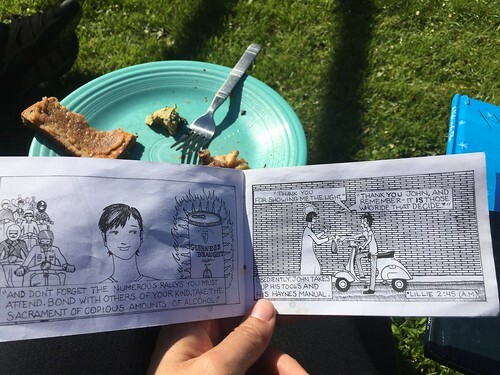 Rob's been part of the west coast scooter scene for a while, and handed me this fantastic chick tracts style minicomic from a rally years ago. I believe it was put together by the now defunct Hells Belles SC. Any further information or copies of this genius would be appreciated! 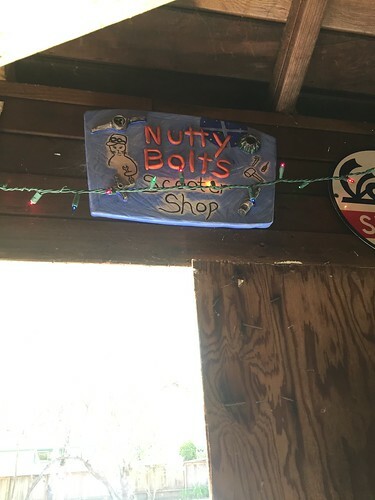 A Night On The Tiles: The origin of Professor Nutty Bolts, as seen hanging in Rob's garage. This is the life. You guys have nailed it. 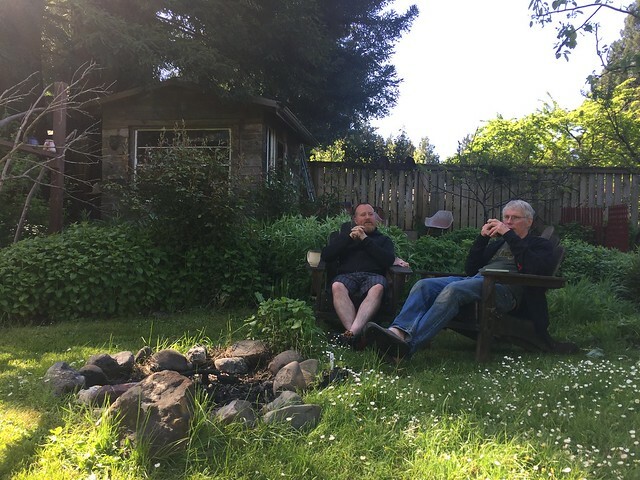 We dawdled over breakfast in the backyard, content to sit by the fire pit, bathe ourselves in warm sunlight, and listen to the chickens clucking and cooing behind us. It was heavenly, too heavenly to get going...but Pete had only one day left before he would turn around. Thank you, Lisa, for reaching out. I'm so grateful to know two such genuine individuals as Lisa and Rob. Hey, Bobby from the Slug Rockets! We talked him into joining us for a quick scoot. 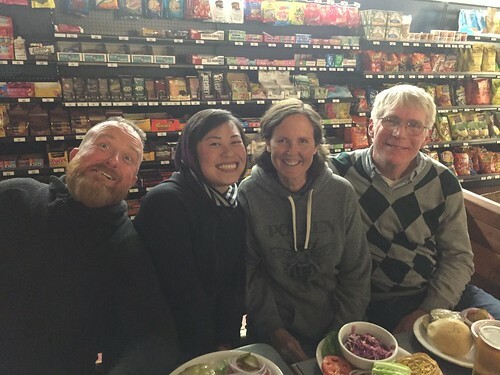 In Arcata, we stopped by Lisa's old bookstore for Independent Bookstore Day and browsed the farmer's market for road snacks. 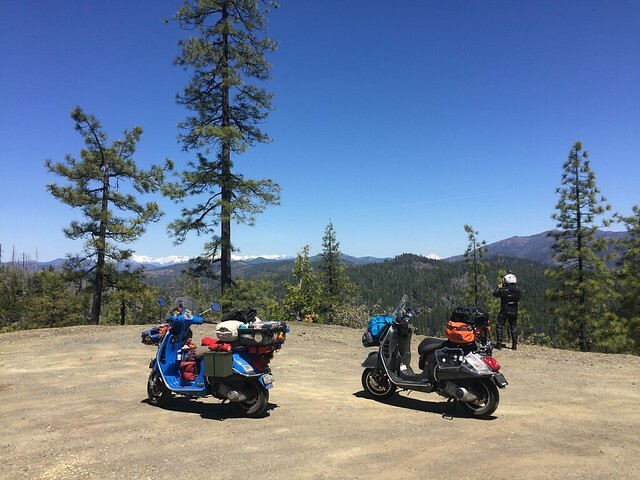 Bobby met up with us on his GTS, and was persuaded to take us on a short jaunt north along a less-traveled road. Indeed, following a couple sharp turns out of town, in some places it was hardly a road at all. The most exciting route dwindled down to just a bumpy, narrow, dusty path that hugged the cliffside, with only open air and a sheer drop to the turquoise Pacific to our left. Lisa had taken the truck along a more accommodating road, but us four intrepid scooters picked our way over what were probably intended to be bicyclist paths. It was absolutely spectacular. One last farewell in Trinidad, CA. Pete and I pressed northward, and spotted a sizable herd of grazing elk as we rounded the bend to Orick, CA. Later, we'd learn this was a unique elk to the area, the Roosevelt elk. 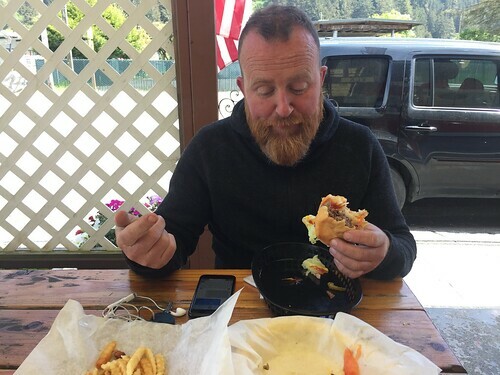 So of course, we stopped at a roadside joint that offered elk burgers. Y'know, to celebrate. The Snack Shack had just run out of elk, but the cook's mother was on her way in the car to resupply. "She's 80, it could be a while," she warned us, but the sun was out and I took the opportunity to call around for a quote for a new top end for Serenity. 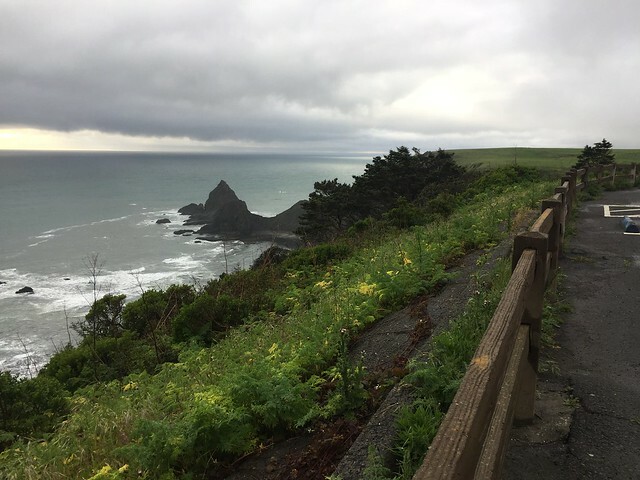 Since Mendocino, every hesitation whether from a gust of wind or bump in the road, I reflexively started looking for a shoulder to coast to a stop. The news wasn't great though, the price of a replacement was high, and labor was costly. I've come a long way as a mechanic and from videos it looked like I could do the work myself, but having never endeavored something as ambitious as this I wasn't confident in my turnaround. A Timesert was another option, but again I would be attempting to take the engine out myself, without a garage, at the whim of a machinist's schedule. It certainly highlighted what I disliked about traveling with a finite schedule: If you're short on time, you need more money. If you have plenty of time, you can get by on far less money. I've always favored the latter approach, but this trip north had a fixed deadline and I chose to have an abbreviated trip rather than no trip at all. The blue Loctite was holding, but for how long? Would I even enjoy another 5k worrying about every hesitation? A writhing ball of anxiety had developed in the pit of my stomach when the elk reinforcements finally arrived. The burger was delicious, juicy, a little wild tasting, perfectly grilled. With the help of wavy fries my anxiety melted away from the inside, replaced with tastiness. If the blue Loctite fails, I'll switch to red, and then high-temp JB Weld if it falls out again. Sacrifice the head, it's going to need a new one either way, I decided to myself. As long as it limped onto the ferry from Haines, I could put off the major work for later. Yup, procrastination was the answer! I felt better about my decision making already, or maybe I was just happy because I was full of elk. Just taking my blue speeder bike through the Forest Moon of Endor. Pew pew! 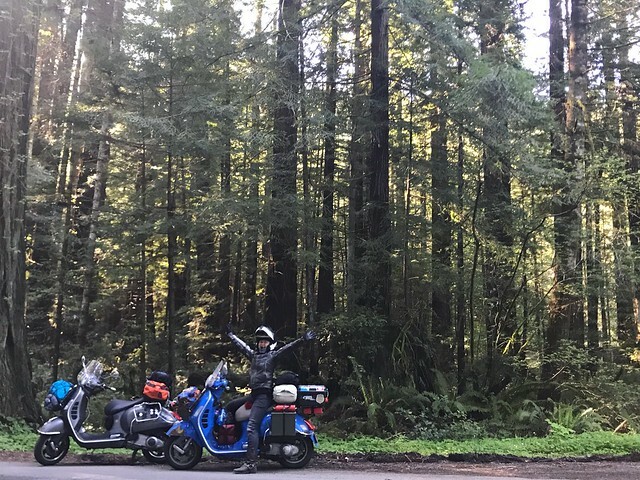 The landslides near Leggett meant we didn't get to ride through the Drive-Thru Tree or take the Avenue of Giants, but we did take a moment to enjoy Newton B. Drury Scenic Parkway. 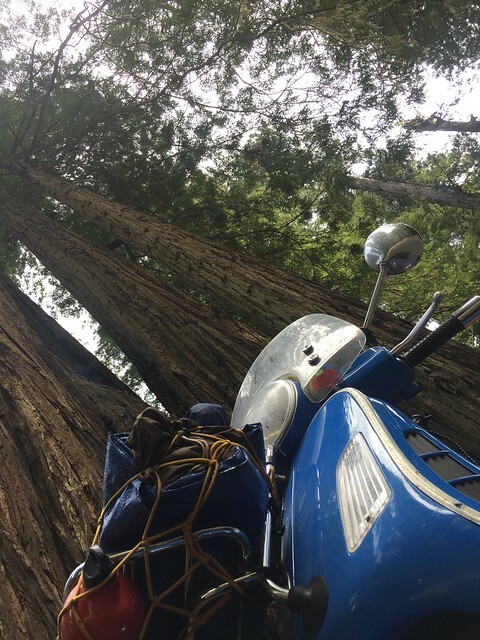 No matter how often I ride through Redwoods, it's always stunning. Pete's bike is a multi-state GTS now. 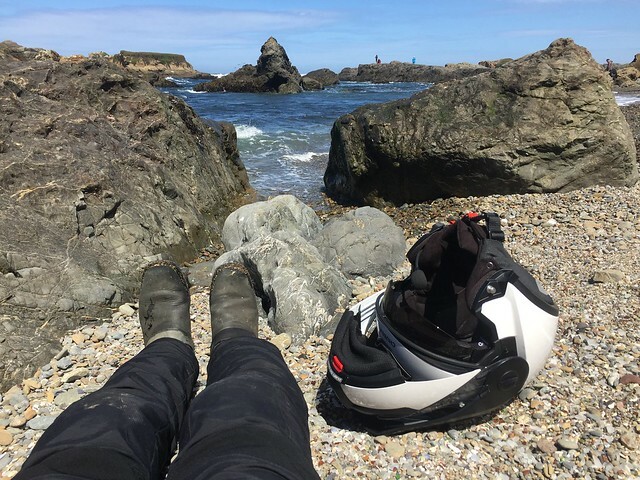 Topography doesn't care much for the arbitrary borderlines drawn by humans, and much of that gorgeous craggy coastline remained constant upon crossing into Oregon. 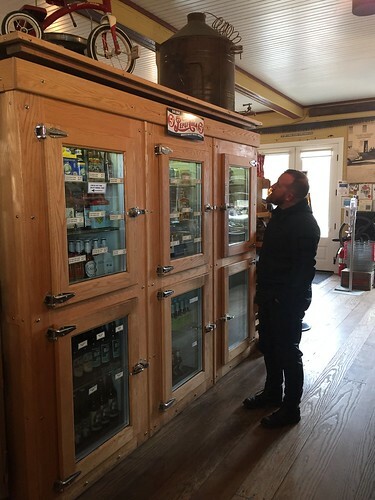 There were, however, two qualities that made themselves immediately apparent across the state line: gas pumps no longer had that extended foreskin you have to pull back to fill up, and cannabis shops were aplenty. In fact, there was one visible from Californian soil. It was modestly named State Line Cannabis, which was disappointing; not even an attempt at a clever canna-punning name. It used to be fireworks you cross state lines to buy, but I suppose times change. Also across the line I spotted a truck weighing station, and nearly made a GTS sandwich doubling back so I could weigh my scooter. 500lbs fully loaded, hello my little wide load! Granted, the scale only went up in 50lbs increments (later, I found another with 20lbs increments, and it still hovered around 480lbs). 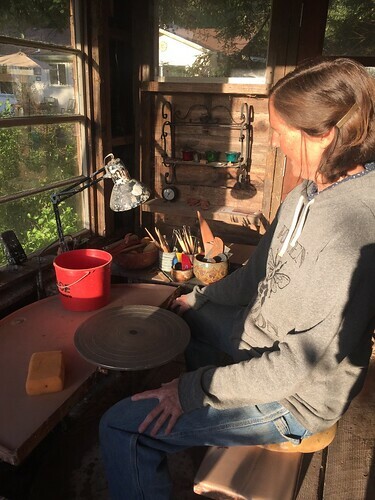 Gold Beach's lone scooterist and consummate craftsman, Gary. 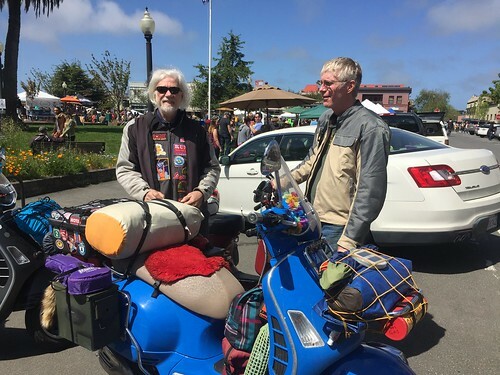 I'd contacted Gary, Gold Beach's lone scooterist who I'd met very briefly my first time through 2.5 years ago, blogging from esteemed Gold Beach Books. 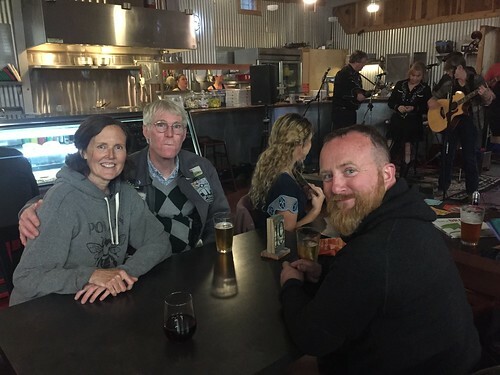 We missed the opening hours of the coffee house but he'd set us up nicely at his son's workplace, and we chatted easily about his work projects and the upcoming rally in Oregon. 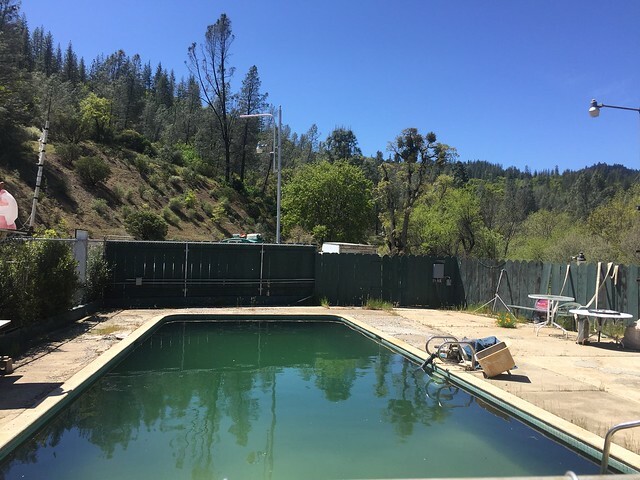 We even met a real miner, a man who moved to California because he dreamed of panning for gold (it turned he'd purchased mineral rights to a plot by the river that was only rich in zirconium). As the shadows grew long, I realized with a pang I was going to be lonely when Pete turned south. 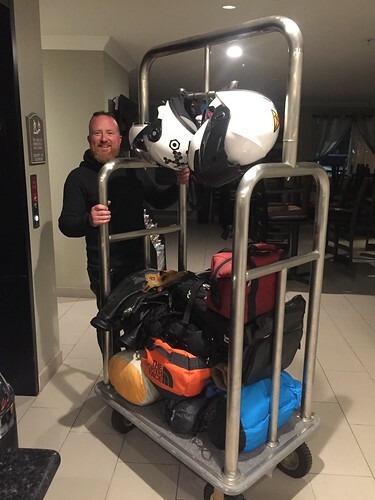 Perhaps Pete was feeling similarly, because instead of us parting ways (for me to free-camp farther north) he suggested crashing at the Pacific Reef Hotel next door. 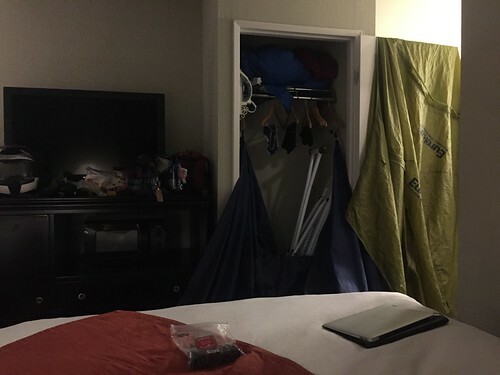 Both of us too exhausted to go out for dinner, we feasted on leftovers in our enormous suite of a room, "lightening the load" for Pete's ride back. I killed off the remaining half of my burger from Fieldbrook with some box wine, and shared a kolache from the Eureka farmer's market with Pete for dessert. I didn't so much sleep as pass out.